The American Heart Association is the nation's largest voluntary health organization fighting heart disease and stroke, supported by 22.5 million volunteers across the nation. The dollars raised at the 2011 York County Go Red event will fund cardiovascular research, education and outreach programs. Our targeted educational programs help raise awareness in men, women and children about the prevention and treatment of cardiovascular diseases and stroke. Every year, more than 20,000 Mainers are hospitalized because of cardiovascular diseases. Cardiovascular disease remains the number one killer of Maine residents. Heart defects are the number one birth defect in children. In addition to the human toll, the cost burden of health care charges and disabilities amounts to over one billion dollars every year in Maine. 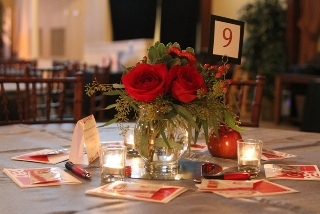 To continue to efforts of the American Heart Association, the 2011 York County Go Red event will be held on Thursday, November 10, 2011 at The Coastal House, Wells, Maine. The event will include entertainment and educational speakers, dinner, a silent auction and much more. Guests include many prominent leaders from the corporate, medical, and social communities of Southern Maine. The Planning Committee looks forward to recognizing your company as a sponsor of the 2011 York County Go Red event. Please come join in the festivities and help fight heart disease and stroke. Your support may help save the life of someone you love. This event will encourage our guests to look forward to the day when heart disease and stroke no longer take the lives of so many that we love. By remembering the faces of those personally touched by heart disease and stroke, this event will allow us to celebrate life and support vital research to help improve the lives of those affected by cardiovascular diseases. Please join us for a wonderful evening of networking and entertainment as we work toward our common goal: Building healthier lives, free of cardiovascular disease and stroke.